OEM and third-party certification programs are a good move for collision repair shops and technicians — and soon the process will grow even more specific, according to members of an expert panel last month. VeriFacts’ Farzam Afshar, I-CAR’s John Bosin, Assured Performance’s Aaron Clark, Honda’s Gary Ledoux and G.W. & Sons Auto Body’s Gary Wano Jr. discussed certification March 19 for the National Automotive Service Task Force forum ahead of the Northeast show. Panelists stressed that things in the industry were changing so quickly that it was suicide not to keep up-to-date with training and equipment, as expensive as it could be. Ironically, the standards you’re trying to achieve for a manufacturer don’t always come out of their own “manual.” Afshar observed that VeriFacts uses what the OEM recommends for standards, but moves to I-CAR if the manufacturer doesn’t address the problem (there’s a “lot of holes in there,” he said), and then they look at suggested best practices from the industry. “We mishmosh all of that together, and then technicians do the best they can based on those things,” he said. Panelists explained how validation works in practice. Wano said that OEMs typically leave it to a third party, who comes in to make sure a shop has the equipment and can use it competently. “They might not literally sit and watch the piece of equipment being used,” Wano said, but they’ll ask technicians repair questions to see if they’re indeed qualified on it. Bosin said I-CAR just looks at who’s gold- and platinum-certified. Ledoux, the only OEM representative in the panel, said it just depends on what Japanese leadership wants. “We simply have that on a list for our shops,” he said. Afshar said VeriFacts will do a surprise visit to a shop and really look at the details of a repair at various stages of the work — giving the example of confirming more than 200 necessary welds. This can even get down to measuring the headlight’s installation after painting is completed, he said, pointing out that Mercedes specifies it as a safety factor for some vehicle. “Old days, shops did not think about that,” he said. One of the biggest benefits mentioned besides staying ahead of the competition was staff morale and retention. You’re not an auto body tech any more, you’re a technician specializing in a certain make. “That seems to intrigue our staff, having the ability,” Wano said. Wano’s business is certified on several luxury/exotic vehicles, and he said this factor attracts staff who want to work somehere with that cachet. “That says something in our industry,” he said. Besides the benefit of employee satisfaction (which certainly can save lost productivity from gripers and turnover), there can be other returns on the investment — though based on the panel’s answers, you shouldn’t expect that payback immediately. Wano said he had one certification that still needed fleet size increases before he’d see a profit, and he observed that in some cases ROI won’t be met for 18-30 months. But if you keep doing the right thing, it’ll pay off, he said. It also helps if you can transfer the skills and equipment over to multiple manufacturers to increase the potential traffic through the least up-front expense. Sometimes, that isn’t always possible, he acknowledged, joking that his shop had as many welders as Reliable Automotive Equipment and a lot of different rivet tools to satisfy various manufacturers. But certification is “satisfying in itself,” he said. Ledoux was more upfront — sure, ProFirst will promote shops, but the program truly exists for Honda and its customers. “This is about getting the job done right,” he said. That said, he did note that he’s had Honda owners ask him why their usual shop wasn’t on the list and then start considering the implications of that fact. Clark said it mattered because success in business can mean finding a way to distinguish yourself from the competition. In an industry being pressured to the lowest common denominator, “you have separated yourself above and beyond the majority of the marketplace” by reaching that level of ability, Clark said. “It’s a big-picture thing,” Clark said. Besides, it might be a question of survival. “Is it just the price of admission?” Clark asked. It might be also cheaper to do it now than put it off. “Today’s a good time to jump into this,” Wano advised. There is breathing room still to figure out the new technology and how your business should adapts to it before more of the mainstream models are revised as dramatically as the aluminum F-150. Bosin was the most specific, noting that I-CAR had found “double-digit gains” in ROI and profitability from its certifications, and Bolton agreed that technicians get the job done right in one take (which would have benefits on cycle times and prevent wasting time redoing a job). Afshar also said there was a certain value in being able to sleep at night. “We don’t believe you should be required,” he said — shop owners should learn best practices because it’s the right thing to do. About a decade ago, OEM collision programs were just marketing tools meant to sell parts, Bosin said. Now, they really care about the brand and consumer. “They want the owner to have the best collision repair process possible,” he said, and know the OEM had a role in it. “It’s really been a huge change at the OE level,” he said. Afshar said from VeriFacts perspective, OEMs want to protect their brand and know their five-star safety rating will be intact after an auto body is fixed. Some OEMs are focusing on specifications of equipment, not brands, and sometimes they will have similar requirements, which as Wano noted makes life easier for the collision repairer. Panelists were sympathetic to this idea. 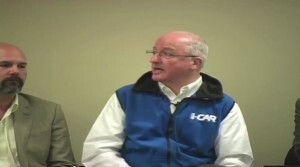 Ledoux said that Honda concluded that some really good shops hadn’t necessarily sought the I-CAR Gold certification route, so the manufacturer accepted VeriFacts VQ or VQ Medallion for ProFirst as well. Afshar agreed with the idea that if a shop underwent rigorous VeriFacts VQ or VQ Medallion evaluation, then they should be able to skip the expense of a separate OEM-required certification program. “I don’t believe we should send them to another set of training just because we can,” he said. Plus, there’s just the convenience factor to OEMs themselves. Bosin said that I-CAR has historically offered a way to provide high-level training, saving manufacturers from having to create their own education programs. One interesting OEM wrinkle is that while manufacturers more and more want shops to be certified, they’re not keen on sharing the training needed for it, according to Bosin. Some manufacturers view best repair practices as proprietary information that should be restricted to protect the brand. “In many cases, those OEs will specify that a shop have a number of I-CAR classes before they even get the more-intensive specifc training that they each provide,” Bosin said. But sometimes, the training just can’t overlap, no matter how good it is, and the panel seemed to predict that training is likely to become more and more specific — even down to the tool itself, Clark forecast. “Each vehicle is different,” he said – and they will grow further apart as manufacturers make different technological choices. “To me, it’s a case where the vehicle technology is changing so fast that these things are going to consistently and constantly change as well,” Clark said.